Reading a French book to your students is a great way to end a lesson. 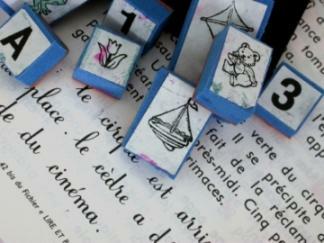 Creating your own French lesson plans is easy to do. However, there are also a variety of lesson plans, activities and ideas online for you to research as well. Keep reading if you're looking for tips to make your French class truly memorable! Introduction to the New Concept 15 min. You should next introduce your new concept. In general, a clear and concise explanation of what you're going to do works best in a foreign language. If you're teaching vocabulary, try to speak in French as much as possible. Even if you have to speak in French and then translate into English--that's better than simply going over vocabulary by saying the French and then translating. If you're teaching a grammar lesson, you may well find that you'll have to use quite a bit of English as often students don't know their English grammar that well. Reinforcing the New Concept 20 min. This is the time that you give students to practice. Sometimes, it will work well to give them an "assignment" that they will have to share with the class. However, the primary goal at this time is to help your students get the concept and master it. Introducing one artist, famous monument, French history fact or some other aspect of culture to your students. Get the students to pay attention by giving a mini-quiz or using the material as extra credit. Reviewing tenses by randomly selecting students (the ones you didn't select at the start of class) to tell what they will do, what they wish they could do, etc. Going over some aspect of current events in a French speaking country. Showing a native source such as a newscast or passing out a magazine. Bastille Day is July 14th but it is the epitome of French independence. If you start your year in August, consider doing a lesson at the very beginning of the school year on this National French holiday. The Winter Carnival in Québec is a highlight of French Canadian culture. It is held annually starting in mid-January. Charades--The students who are guessing have to yell out the word in French. Pictionary--Same idea--those who are guessing need to call out the word in French. Simon Says--Appropriate for when you've been studying parts of the body--even if your class is older. Go Fish--great for reviewing numbers or you can even make your own "Go Fish" sets with colors, vocab, etc.--anything you've been studying. A good French teacher will present material in a consistent manner, with a target goal of getting the students to learn to speak the language. A great French teacher, will incorporate variety, be creative in getting things to stick, and get the students to speak in context.